Posted on Sat, Nov 26, 2011 : 5:58 a.m.
A difference in perspective can change everything. Turned away from the TV where the Detroit Lions were getting ready to tackle the Green Bay Packers, I was tackling the final touches on the Thanksgiving side dishes while American Idol’s Lauren Alaina was starting to sing the National Anthem. ” I turned around as I heard the refrain return and watched as the Nashville recording artist finished with a flourish and a big smile on her face. Must have been a technical snafu; she didn’t appear to be embarrassed. “It’s all about how you finish,” said Fox TV announcer Joe Buck. Just as quickly as it happened, Lauren Alaina’s name spiraled into a Twitter trending topic. It wasn’t a technical problem. She had briefly forgotten the words to the Star Spangled Banner. That realization gave Joe Buck’s response to an awkward situation an even more gracious appeal. 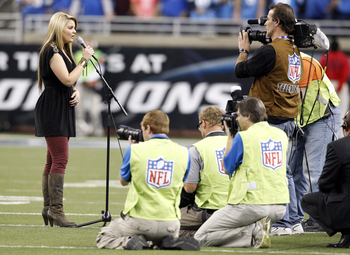 American Idol runner up Lauren Alaina sings the national anthem before an NFL football game between the Detroit Lions and the Green Bay Packers in Detroit on Thursday. There have been far worse moments in the rendering of our National Anthem. Christina Aguilera (wrong lyrics) and Roseanne Barr (irreverent and extremely inappropriate) are two such disasters. Jose Feliciano’s rendition in the 1968 World Series veered from the traditional and perhaps was the beginning of performers taking their own spin on the song. The controversy that ensued then helped to spawn the career of the late Robert “Fat Bob” Taylor, who after that was tapped for National Anthem duties at Detroit Tigers games. Ever the professional, “Fat Bob’s” booming tenor was the perfect patriotic moment most of us hope to feel during our nation’s song. Perspective can dictate our course of action. New information could be released that changes one’s perspective about what happened at Penn State, but after reading the 23-page grand jury report I think Penn State officials lost their perspective altogether concerning the handling of allegations of sexual abuse of children by a former Penn State assistant football coach. Even if Coach Joe Paterno and others in a position to know followed school protocol by telling superiors, it doesn’t appear that any one of them took the collegiate cloak off long enough to alert police on his own. The only perspective there seems to be solely about the preservation of the appearance of a storied football program and the $53 million a year it generates the university. Coach Paterno didn’t finish his career the way he and his ardent fans had envisioned. But more importantly, it appears he failed to finish when it came to doing the right thing for the safety of a child. It’s all about how you finish, Coach. Perspective can give us new insight. Standing on a Plymouth Road sidewalk waiting to cross the street, you see the value in Ann Arbor’s new ordinance commanding motorists to stop and let you cross. If you are that motorist, from your perspective stopping can be an accident waiting to happen. Proponents of public art in Ann Arbor say it enhances the community’s attractiveness. That perspective can change depending on the work of art and whether it is funded with public dollars. The predictability of Ann Arbor City Council discussions changed perspective this past week with the added voice of independent Jane Lumm, drumming new life into what had become a sameness of decision-making from a fairly like-minded body of Democrats. We’re all going to have a new perspective following the closure of the East Stadium Boulevard bridges for year-long construction beginning Monday. In which case, I think we should take a cue from the perspective of Lauren Alaina. Just keep that smile on your face and go for the finish. Lucy Ann Lance co-owns Lance & Erskine Communications, which produces “The Lucy Ann Lance Business Insider” (M-F, 8 a.m.-11 a.m.) and “The Lucy Ann Lance Show” (Saturdays, 9 a.m.-12 p.m.) on 1290 WLBY. The programs are live streamed at www.1290WLBY.com, and podcast on www.lucyannlance.com. Sat, Nov 26, 2011 : 4:12 p.m.